I just did a search on my blog for impatiens, I found 0 results, I can’t believe I’ve never mentioned this plant in a post before. It is my firm belief that every ornamental gardener (and even vegetable gardeners – to attract pollinators) should plant both perennials and annuals. I love perennials because you plant them once and you’re done, they do well in droughts because they have stronger roots, and over time you can even get free plants as they multiply. But in general perennials only flower for a short period of time. A nice tropical annual on the other hand can flower, and flower, and flower, from your frost free date in the Spring (assuming you bought starter plants or started your own seed indoors), until the first frost in the fall. Mixing annuals in with your perennials allows you to provide constant pops of color, constant bee food, even when nothing else might be in flower. They’re great really. I also love them in containers, since perennials in containers will eventually become root bound. A large urn-style container in the shadier part of my yard bubbling with vivid impatiens. Of course, perennials have their place too, because lets face it, gardening with only annuals would get quite expensive if you have to buy a garden’s worth of plants each and every year. Of course you’ll save a ton of money if you can start them from seed, but it does require some infrastructure, a greenhouse or a well setup, large, south facing window. One day when I get my greenhouse (next summer, yippee) I’ll probably do that, but for now, I’m out there buying flats like everyone else. I do prefer to buy flats of the smallest, cheapest, annuals, not bigger plants all done up in premade baskets or anything, I don’t find value there. Moving on, impatiens, I love them, they’re so neon bright it is amazing for a plant that doesn’t like the sun. They’re like little jewels glistening in the shade, really bright pops of color. Off the top of my head I cannot think of any other shade plant that flowers like that, not one. Something like a coleus can get bright foliage, but not like this. Hydrangeas and Rhododendrons do okay with some shade, and get big showy blooms, but not this vibrant. So I’m moving this summer so I’ve greatly paired back the functional aspect of my gardening, fewer herbs, fewer vegetables, because I won’t be around to harvest them anyway. However I am increasing my annual flower planting to make sure there is always bright and beautiful flowers whenever a realtor might show the house. 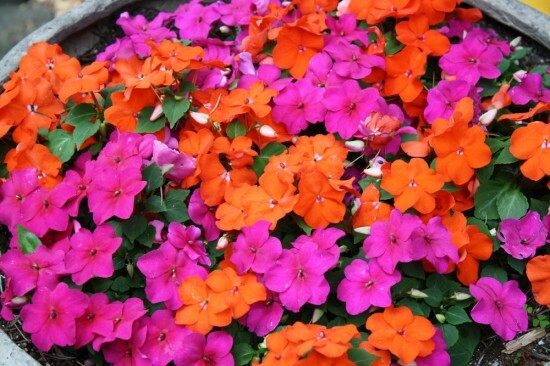 So I went to the big box store and bought a tray of impatiens, a mix of colors. There are more upright varieties, premium varieties, but like I said above, I like the cheap ones. Then I, with the help of my kids, planted them in some large planters in the heavily shaded part of my backyard. This was just a few weeks ago, and already they’ve filled in, and resemble large bubbling cauldrons of color. Generally I think each annual has a place. Petunias or marigolds love full sun, and being planted directly in the soil (I know, I know, you’ll find petunias planted in containers all the time, especially hanging baskets, but you will be watering them twice a day), so they have enough to drink. Begonias are my go to (and more or less the only thing I will consider) for small containers or hanging baskets in full sun, because they are highly drought tolerant. You basically never have to add supplemental water to a begonia basket so long as no roof is obstructing natural rainfall and you’re not in an arid climate. 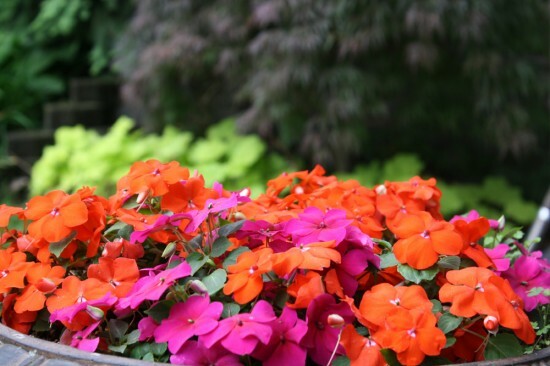 Impatiens are for shade, and they also do fairly well in shaded containers or baskets. I do not think they are as drought tolerant as begonias, but being in the shade there is certainly less need for water overall. They’ll also let you know when they’re thirsty by wilting, and pop back pretty quickly when quenched. Bottom line, impatiens are a star in the shady garden, or in urns or planters on shady porches and decks (if there is a roof over them though, you must remember to water). If you’ve never planted them before, you really don’t know what you’re missing.